Headwinds at 30 knots, lots of banging as the bow rides up the swell, lifts off and then slams down hard into the trough below. If you’re sleeping near the front of the boat you experience moments of weightlessness in your bunk before being slammed down again. It is truly amazing what sort of conditions your body can get used to sleeping in. It helps to be exhausted. While we have headwinds we have to motor. The yacht carries a fair amount of diesel in her tanks but we really don’t want to be using it unless we absolutely have to. We try steering off the wind so that we can throttle down the engine and save fuel, but our VMG drops dismally. VMG, or Velocity Made Good, is the speed at which you are travelling towards the place you want to go. If you’re doing 10 knots and heading straight for your waypoint your VMG will be 10 knots. But, if you’re travelling at 12 knots and heading 30 degrees to the left or right of your waypoint, then your VMG might only be 7 knots. So we constantly play this game trying to find the optimal balance of VMG and trying not to burn diesel. (We have to get the boat the Stanley in time for an expedition of climber going to South Georgia near Antarctica). We are still fishing but have caught nothing. On our previous trip we caught massive tuna within a few hours of putting our line out. This line has been our for days and nothing… As is the way of the fisherman, we fiddle and faff with lures and tracers and different distance trawls, all to no avail. It does give us something to do though. Thomas made a risotto for dinner. Thomas does not come across as the kind of person who could make a risotto, but he nailed it. I think he was lucky. Not complaining. Chris showed his face briefly but now Paula is starting to look a bit grim. So far the only people that have not got sick are myself and Thomas. I keep wiping down all the surfaces with disinfectant in a probably futile attempt at trying to pretend like I’m not living in a caravan with plague victims. Thomas reckons it’s his diet of black coffee and tobacco that is keeping him healthy. Not sure what’s keeping me immune. We have some new kit on the boat this year. In fact everything in this photo, except the radio (top left), is brand new and was installed in the days before we left. That might sound a little risky but surprisingly nothing in the photo is essential and we have backups for anything important. I’ll run you through the photo: Top left we have the radio. The funny hole directly below it is where the fancy new radio was meant to go but that died shortly after installation so we reverted to the old one. Most modern equipment is networked, so the radio is getting our GPS coordinates from a black box under that desk. Just to the left of that red button is a small plastic cover with a smaller red “distress” button underneath it. If someone where to lift that cover and press that button, the radio would start to transmit a digitally encoded distress signal with our boat’s unique registration number and our coordinates. 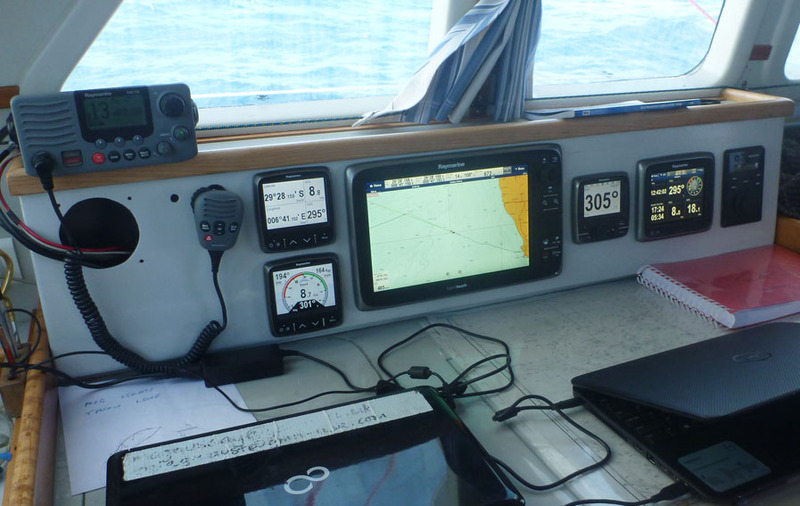 Any vessel in range with a DSC (Digital Selective Calling) system on board (which is most of them) would start to have alarms go off and see our details on their screen. That said, we haven’t heard the radio peep for days. There have been no vessels in VHF range for days, so that distress button would be useless. In another post I’ll explain EPIRB, which uses satellites and is how we would let the world know if we were really in trouble. Next we have all the displays . It’s important to note that most modern displays are “multifunction” which basically means it’s just a screen and you can select what you want it to show. What we’ve got up on the screens in the photo is just how it was at that point in time. We’re constantly changing things depending on the conditions. The first screen, top left, is showing our latitude and longitude, our SOG (Speed Over Ground, which uses GPS) and our COG (Course Over Ground) which is the resultant direction we are travelling in. When you’re sailing there are lots of forces pushing the boat in different directions and the result of them, the direction you’re actually travelling in, is hardly ever the direction your bow is pointing in. The screen below that is for wind. It shows the wind angle and speed relative to the direction we’re heading in. The big screen is a multi-purpose. It’s currently showing a chartplotter which displays our historic track and current heading. If there were any ships within VHF range we’d probably see them on the plotter as AIS blips (I’ll explain that in another post). This screen gets changed to the radar output at night and can even be used to show the output of our FLIR passive infra-red thermal camera. To the right of the big screen (showing “305°“) is the autopilot control. There are various ways to use an autopilot (compass angle, angle to the wind, waypoint etc). Currently it’s set to a compass angle and is trying to maintain a course of 305°. To the right of that is another multifunction display which is showing the local time (GMT is on a different clock not in this picture), another COG and SOG, the average wind speed and the times for sunset and sunrise. To the right of that is the FLIR camera control which is turned off. I’ll post a video showing off the FLIR camera in a future post. At night everything is dimmed and set to night colours so that we don’t lose our night vision. Even with all the technology in the world you still need someone awake at all times scanning the horizon for lights and looking after the sails. Underneath the two laptops are the paper charts for the area we’re currently in, and the big red book is our logbook which gets an entry every hour on the hour. I had been up since the start of my shift at 9pm the previous day, was on watch until 2am, but then decided to stay awake to watch the sun rise. It was glorious and the gravity of where I was finally begun to sink in. Hundreds of miles away from land and civilisation. The wind is gone. It is hot. The sea is calm but small swells roll by. There is nothing for miles. We are alone. It feels like we’re all finally acclimatised to being on the ocean. The speed at which I run up and down stairs and pull myself through hatchways is increasing. My body has stopped trying to make sense of the random motion of the sea beneath us. I go to bed around 8am. The sound of the sea sloshing past my head is incredible. The squeaky block is still squeaking but in the moments between squeaks I can close my eyes and hear the ocean, hundreds of meters deep beneath me. I imagine what it must be like to do these kinds of voyages by yourself, does this gentle ocean lullaby become a deafening reminder of your isolation or is it just as calming? I sleep. Even though the engine is running, the noise of water and engine blend into one. I get up at around lunch time and the wind returned. 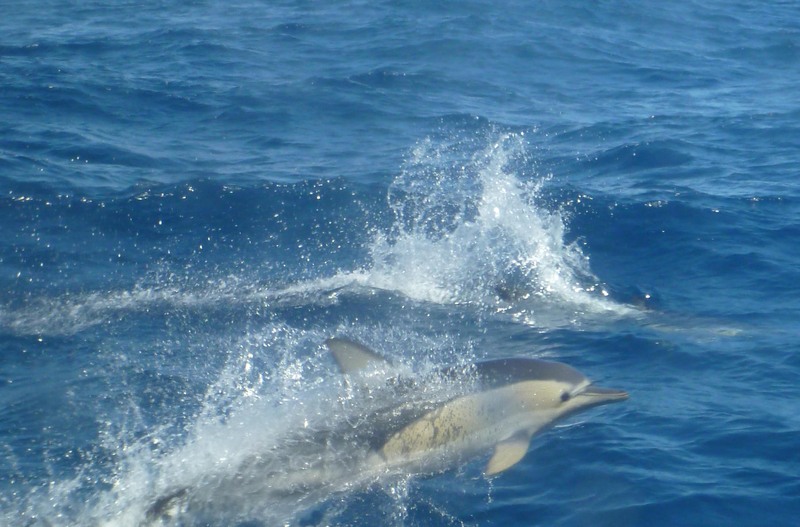 We are being followed by a pod of dolphins. I think they’re interested in our echo sounder. At sea there are no nurses, no janitors. It’s the crew and you’re a family, whether you like it or not. I have been deathly ill at sea, stuck on deck, freezing, throwing up, while another crew member, a Kiwi girl named Kali, who was equally ill and equally throwing up, helped me put on some warmer pants between our bouts of mutual hurling. Nothing quite bonds two people like vomit and warm socks. You will see the best and the worst of people at sea. We are trapped. There are times when you have to bite your tongue to keep the peace. Times when you have to drop a friendly argument because you realise that someone is starting to take it a little too seriously. A great skipper, which Magnus certainly is, has to be commander, best friend, mediator and psychologist with each member of the crew. The unavailability of Wikipedia to settle disputes is a sore point with everyone. We make promises to, when we have internet again in a few weeks, forward URLs to each other to prove ourselves right. This is life at sea. Started the engine for the first time at 8am after a few glorious days of sailing. One of the things that have been giving us hassles is the water speed transducer (log). It hasn’t been working since we left Cape Town. It’s not essential, but it’s useful to work out what the water currents are doing. A lot of the electronics on board is brand new, so niggles are bound to happen. We needed to figure out if this was dodgy wiring, an incorrect setting or a blown transducer. Not easy when the transducer is 60 feet away from the displays. After many hours of debugging we figured out that the problem was a blown transducer, probably due to someone spinning it at a gazillion miles an hour with a high pressure hose when they were cleaning the hull. Luckily we had a spare and after a few hours of unpacking bilges, rerunning wiring and carefully repacking, we had our water speed back. One of the amazing and unexpected results of this was that the autopilot, that we had been thinking was a little jumpy, suddenly settled down. Obviously it uses water speed in its equations but wasn’t complaining about the water speed being non-existent. Live and learn! It was now making small, neat and precise adjustments, like a champ. We spotted Minke whales a few meters away from the boat, nonplussed by our presence as we slide by at 10 knots. While on watch at around 3am we had to change course to avoid a collision. As dramatic as that sounds, it really wasn’t. AIS data indicated a likely collision with another vessel in 20 minutes. 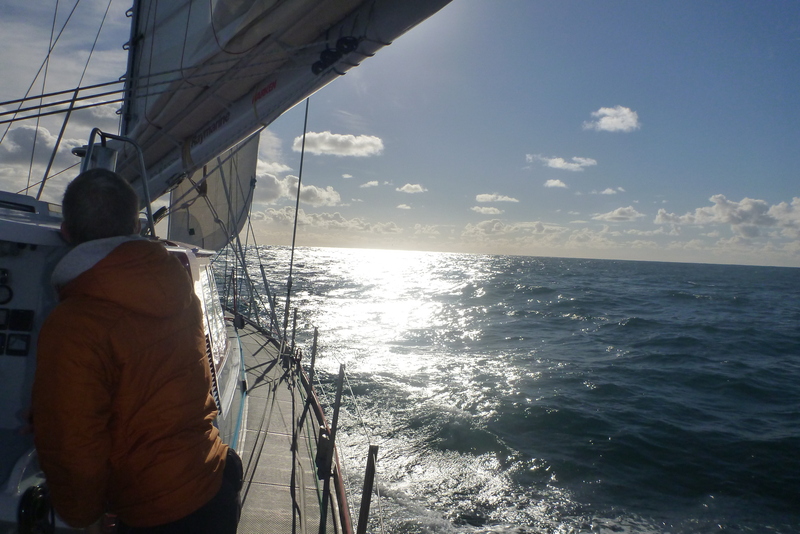 We adjusted our course and the vessel passed within 2nm of us. Technology is awesome. The wind has dropped almost entirely. We put 3rd reef in the main to stop it from thrashing about. Another great day of sailing, we had some challenges with the rudder angle sensor coming off its mounting, but otherwise uneventful. Laura is still sick, it’s definitely not seasickness. I’ve started sanitising all the grab handles in the common areas. There is a squeaky block (pulley) directly above my head in my bunk. It’s running the prang (preventer/vang) and is loaded with a few tons on slightly stretchy line, which is why it’s squeaking. Incredibly how something so simple can make such a huge, and disturbing, sound. It’s like metal scraping on metal, literally 40cm away from my face while I try and sleep. We put out a fishing line, nothing yet. It’s a lure wired up on a bungy cord so that it will not snap the line if we get a strike. A journey like this is as much about the time away as it is about sailing. For me this is a form of meditation without the forced constraints of sitting in a darkened room, legs crossed trying to achieve a state of zen. Boat meditation is more about menial tasks like mending a line or checking sail trim. Obviously there is a fair amount of time spent gazing at the horizon, but it is the time away from everything, away from the hum drum, the bathroom remodelling back at home, the dinner plans, the accounts that need paying, the week’s groceries, away from everything. Out here it is simple. The routine is almost deadening. Wake up, breakfast (probably muesli), faff about for a few hours, do some sailing, make something for lunch, an afternoon nap, maybe read something, get up, sail, help with dinner, bed for a few hours before night shift, up at 10pm, sail until 2am, sleep. The repetition along with the lack of external stimuli and the inherent repetitive tasks involved in running a boat, writing the hourly log etc, really gives you nothing else to do but think. Suddenly the bathroom remodelling becomes something that is important. The loved ones you left behind become achingly far away. It becomes easier to make grand resolutions in this place. It’s said that to turn a good practice into a habit takes 30 days (I’ve also heard 21). I wonder if living a completely different life for a month makes it easier to reset your life when you return? Resolutions are of course notorious. Once you’ve whittled through the obvious ones, get fit, be more organised, be a better friend etc, you’re left asking the big questions: Who am I? What do I want? I am blessed. I live a charmed life. People pay me money to do work that I find challenging and rewarding. I’m happily married to a woman who is happy with her life and it makes me happy to see her prosper. I am able to do these amazing things like sail 5000 miles across the oceans. I enjoy being forced to think. We departed 4 days late because Magnus (the skipper) got food poisoning. The extra days bought us time to do more last minute preparations, which is never a bad thing. At roughly 10am we did one last check/top-up of the water tanks, disconnected the shore power and cast off. We had been to immigration a few days before. The lines came off and we eased out of our berth. The weather was glorious with a brisk breeze to set us on our way. It takes a long time to sail away from land until the point where you can no longer see land. It was probably 4pm before the last traces of shadows that were once land disappeared. I was feeling good. On the previous crossing we left late in the afternoon, I ended up exhausted and feeling quite ill. This time I was chipper, doing menial tasks and keeping busy. While I write this I am reminded of how excited my parents were, especially my father, who pestered me to the point of annoyance wanting to see the boat and asking endless questions about every last detail. That said, I owe this passion to him and I love him dearly. I’m sure I would be the same if I were in his shoes. Watching them on the dock waving goodbye was a lovely experience. Lynnae had to work, we had said our goodbyes earlier in the day, I love her so much for being supportive of my crazy adventures. We exchanged text messages as I sailed away. Dolphins waved us off, tracking the boat for a few miles and then getting bored. As the sun set I started preparing omelettes for the crew for dinner, but I must admit to having to stop half way through when I began to feel a bit queezy. For people who have not spent much time at sea, one oddity is that going below and doing any sort of hand/eye coordination task amplifies any wooziness that one might feel before getting your sea legs. It takes a few days to completely acclimatize. Laura started to feel ill shortly before sunset. This doesn’t look like seasickness… this looks like what Magnus had. Getting a communicable sickness at sea is a very not-fun experience. The close quarters mean that it’s almost inevitable that everyone will get sick. We’re all a little bit shifty at the thought. We spent most of the day doing between 8 and 10 knots with good winds. 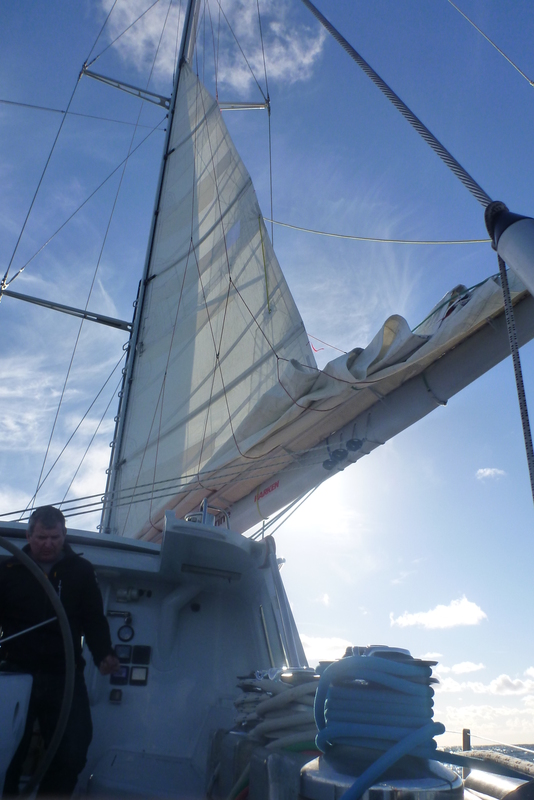 Skipper, Magnus – An all round awesome guy and adventurer. This is the guy you want to be stuck on a desert island with. Originally from the UK. First Mate, Laura – Magnus’ better half. She used to work for the BBC but traded in her desk for adventure. 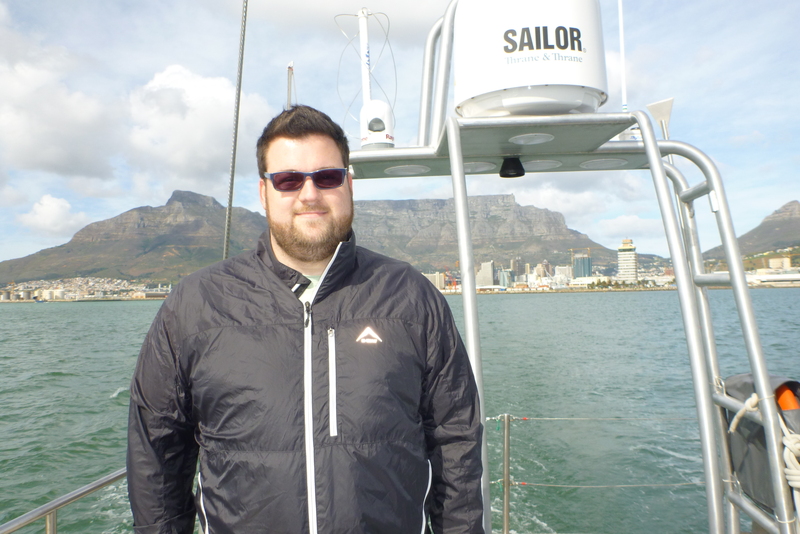 Engineer, Chris – Born in the Falklands and intimately familiar with every corner of the boat. Thomas – A German living in Norway with arctic survival skills and a very manly beard. Paula – An Argentinian biologist specialising in variety of Antarctic fauna and flora. Myself – Freeloader and nerd.